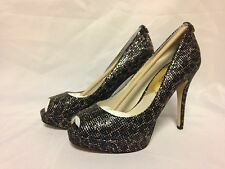 MICHAEL Michael Kors Black Leather Pumps Heels Sz 9 M Shoes Pointed Toes 3.5"
Antoinette Platform Pump. Luggage Tan. Signature padlock hardware adds an extra dash of glamour to this classic platform pump. 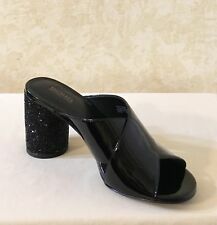 4 1/2" heel; 1/2" platform. Leather upper/synthetic lining and sole. Within 30 Miles of Renton, WA. • MICHAEL - Michael Kors • Women’s size 8M Classic high heel pumps Round toe with silver tone logo Black patent leather is textured and sleek Very clean and odor free Light wear Solid Minor wear on bottom of shoe A wrinkle from footbend on one shoe (see pic) Great condition! Bottoms of the shoes are dirty and have wear. Length (heel to toe)-11". Heel: 3.5". 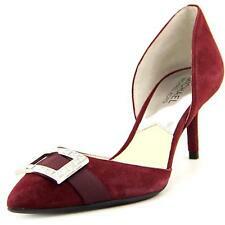 Beautiful authentic Michael Kors Pumps in excellent used condition. Please see images for reference and feel free to ask any questions. All items come from a smoke and pet free home. Clean, sleek lines define a chic peep-toe pump cast in a high-rise silhouette. Textile or leather upper/leather and synthetic lining/textile sole. Pointed toe slip ons. I reference a shoe sizing chart if shoes are missing marked sizes. Color of item may vary slightly due to monitor and lighting variables. cuban heel. soft light brown/tan leather. They are shiny patent leather, with real leather uppers. 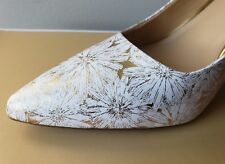 Size 7, hard to find and amazing! 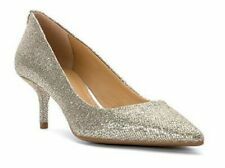 Absolutely beautiful MICHAEL Michael Kors Antoinette Heels. 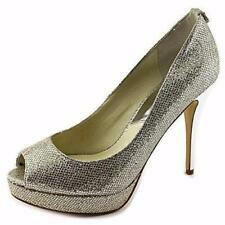 Color is Anthracite Sparkle Metallic, Size 7M. Retail selling price is $140. Condition is New with box. Shipped with USPS Priority Mail. Purchased myself at Macy's in Milwaukee, WI. Thank you for looking! Message me with any questions! 3.25" heel. We believe that pictures speak louder than words and do our best to show several photographs of each item, including any flaws we find. When you are finished, you can check out. 100% authentic! Genuine MK shoes slip on. Blue & white canvas with red detail trim slip on open toe high wedge heels. Good condition shoes for sale, please see pictures. 3-1/4" wrapped heel. Suede Upper; rubber sole. MK logo pattern. Size is marked 25 1/2 I am assuming that is a Japanese size and is equal to a US 9.5. This is a USED item donated to Goodwill of Silicon Valley. They are in good condition with no flaws other then alittle light color faded on front of the leather insoles of the shoes. 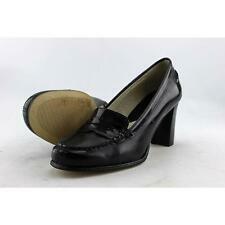 See picture as it does not take away the integrity of these designer shoes.They are in very good condition. New Opportunity Work Program (NOW) : The NOW program exclusively serves the re-entry population and is designed to reduce recidivism and alleviate the burden on Santa Clara County's jails and court systems.